There are many ways to support A Carousel for Missoula. One way – the most fun way – is by riding the carousel a lot. Introduce it to out-of-town visitors, spent time with friends and family there, plan birthday parties at the carousel. Another fun way to support the carousel is coming up next month, on Sept. 19, when the carousel will “celebrate its 19th year of going in circles” with a benefit dinner. Sponsored by Missoula Textile Services, the dinner will start at 6 p.m. in the Caras Park pavilion and include entertainment provided by Headwaters, food provided by Taco Sano and a bar provided by the Badlander. The dinner will also include a silent auction – but first, the carousel needs some items to put in the auction. Which brings up yet another fun way to support the carousel. Clean out those basements, attics and storage units and if you find anything that would make a good donation item, give Carousel Director Theresa Cox a call at 549-8382 or send an email to ponykeepr@gmail.com. You can also call that same number – or just stop by the Carousel – for tickets to the dinner; $10 for kids and $20 for adults. The Silver Summit all-abilities playground is taking shape after three years of hard work and anticipation! 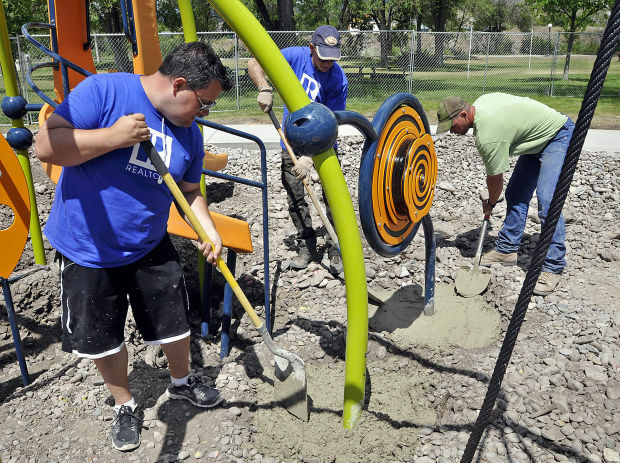 Volunteers work Thursday to install playground equipment at Silver Summit all-abilities playground. Parent of a son with a motor disability and the driving force behind the project, Jenny Montgomery, said she can’t wait to get out and play at the new site slated to open in mid- to late-August — and neither can I! Her excitement about a playground where all children (and adults) can play regardless of their physical capabilities was contagious as she gave me a tour Thursday. Features include a merry-go-round, rain wheel, tunnel, climbing structure, sand box, play cabin, overlook area, and much, much more. The playground’s also spacious so that kids who get overwhelmed can take a break in the shade on the fringe and then come back to play more instead of having to go home. Montgomery said she also hopes Silver Summit help build community and support networks. While the play structures and features began to take shape Thursday, more volunteers to help install the playground are needed to fill 3-hour time blocks on Friday and Saturday between 7 a.m. and 4 p.m. Volunteers should be at least 14 years of age, and will need water, snacks, gloves and closed-toed shoes. If you’re interested, call or email Meg Rogosienski at 552-6271 or mrogosienski@ci.missoula.mt.us. Chances are you’ve heard of the March of Dimes. Have you heard of the March for Babies? It’s coming up on May 31, as this guest column in yesterday’s Missoulian explains. The piece also has a list of ways to reduce the risk of preterm birth. And here it is! Quit smoking before or early in pregnancy. Eliminate elective deliveries before 39 weeks gestation; in other words, those that are not medically necessary. Exercise regularly, take prenatal vitamins and eat a variety of healthy foods – particularly fruits and vegetables – before and during pregnancy. Promote early access to prenatal care; it serves as a critical tool to educate women on how to take good care of themselves throughout their pregnancy. Early prenatal care, in the first 8-10 weeks, also identifies and manages women’s risk factors and health conditions. Screen for anxiety and depression in early and mid-pregnancy. Support women with substance abuse problems in getting the help they need to stop abusing drugs and alcohol. Educate women on the early warning signs and symptoms of preterm labor so that they seek medical attention early. Encourage the use of stress management and relaxation techniques (stress hormones can increase risk of preterm birth). Today is Give Local Missoula Day! Ninety local non-profits are included in the 24-hour fundraising blitz that encourages people to give to the organizations that make Missoula the town we love. The goal is $100,000, and “lounges” are set up around town with snacks and beverages and conversation with non-profit reps. This month, National Child Abuse Prevention Month, is almost over. The Missoulian’s been featuring a series on the topic for the past several weeks, and today we published our own entry. Hopefully, it’s at least as helpful as some of the other columns written by the experts on child abuse prevention in western Montana. The editorial is aimed at encouraging people to at least get started thinking about the hurt children in our community and how to help them. To consider becoming a foster family or a court-appointed special advocate, or perhaps lending some volunteer time, extra household supplies or monetary donations to one of the several organizations that provide support to families at risk. The long-term aim is to stop the cycle of abuse and give children the best possible start in life. The immediate result is making a real difference in the life of a kid, right here in Montana, who needs to know that he’s not alone.